Publications are arranged in reverse chronological order. S.M. Clifton, E. Herbers, J. Chen, and D.M. Abrams, "The tipping point: A mathematical model for the profit-driven abandonment of restaurant tipping," Chaos 28, 023109: Feb 8 2018. My copy: click here or on image. Publisher's copy: here. Supplementary online material: text here. T. Kotwal, X. Jiang, and D.M. 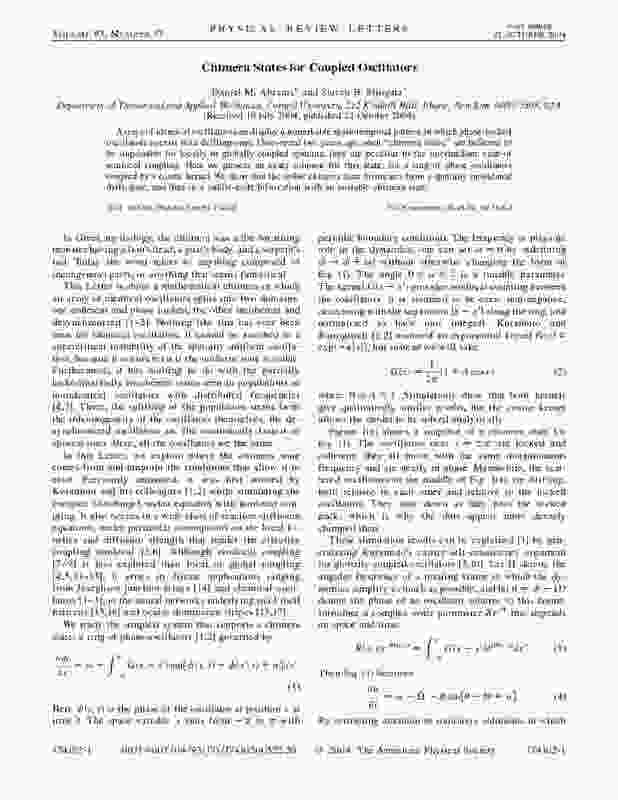 Abrams, "Connecting the Kuramoto Model and the Chimera State," Physical Review Letters 119 (26), 264101: Dec 29 2017. J.C. Lang, H. De Sterck, and D.M. 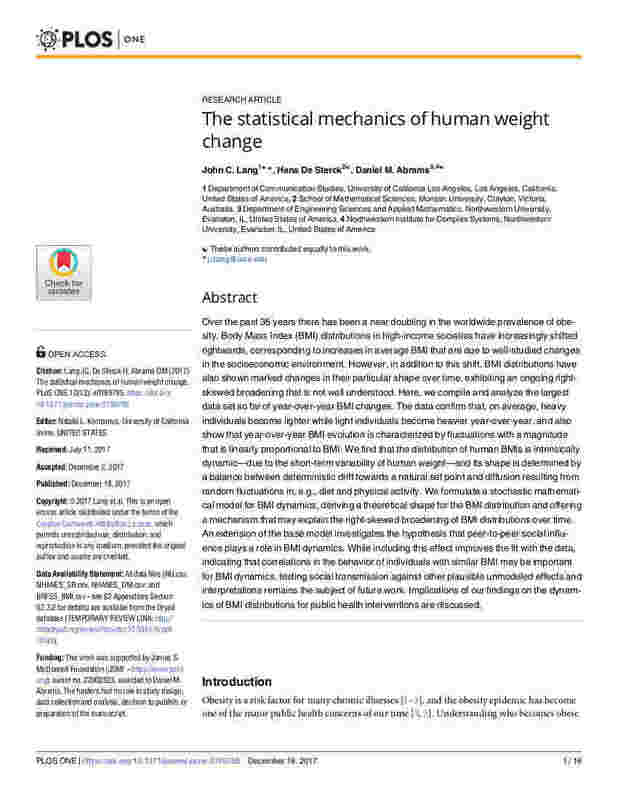 Abrams, "The statistical mechanics of human weight change," PLOS ONE 12, 0189795: Dec 18 2017. Supporting information: text here, video here, Matlab code here, data here. 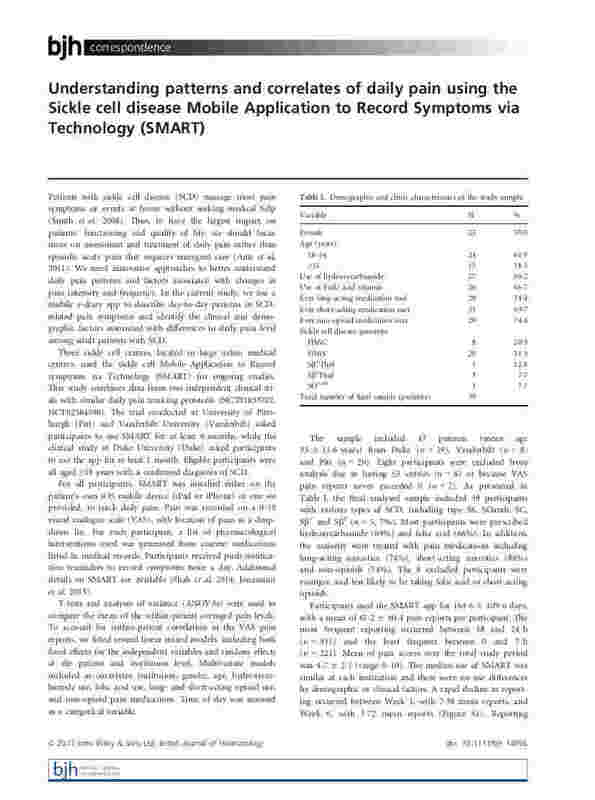 Jonassaint et al., "Understanding patterns and correlates of daily pain using the Sickle cell disease Mobile Application to Record Symptoms via Technology (SMART)," British Journal of Haematology: Oct 26 2017. 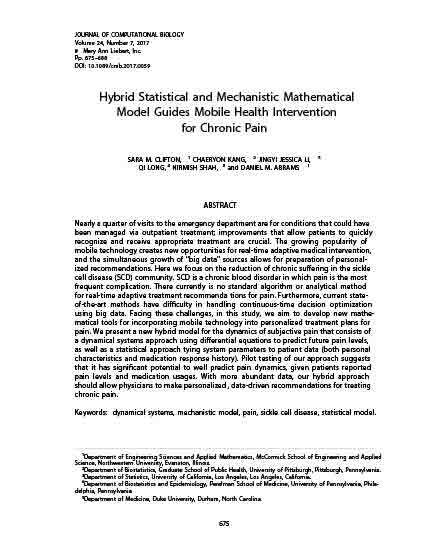 Clifton et al., "Hybrid Statistical and Mechanistic Mathematical Model Guides Mobile Health Intervention for Chronic Pain," Journal of Computational Biology 24, 675-688: Jul 1 2017. S.M. Clifton, R.I. Braun, and D.M. Abrams, "Handicap principle implies emergence of dimorphic ornaments," Proceedings of the Royal Society B 283, 1970: Nov 30 2016. Electronic supplementary material: text here, data here. X. Jiang and D.M. 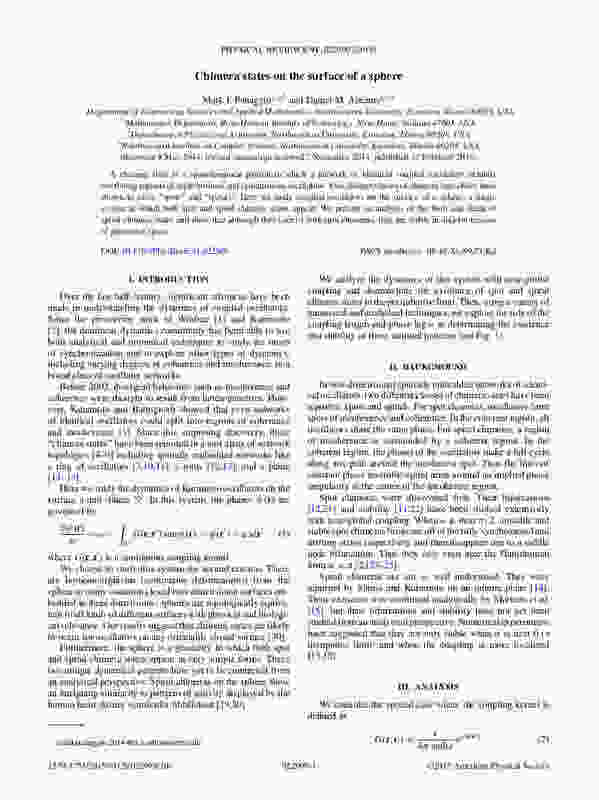 Abrams, "Symmetry-broken states on networks of coupled oscillators," Physical Review E 93 (5), 052202: May 2 2016. E.A. Martens, M.J. Panaggio, and D.M. 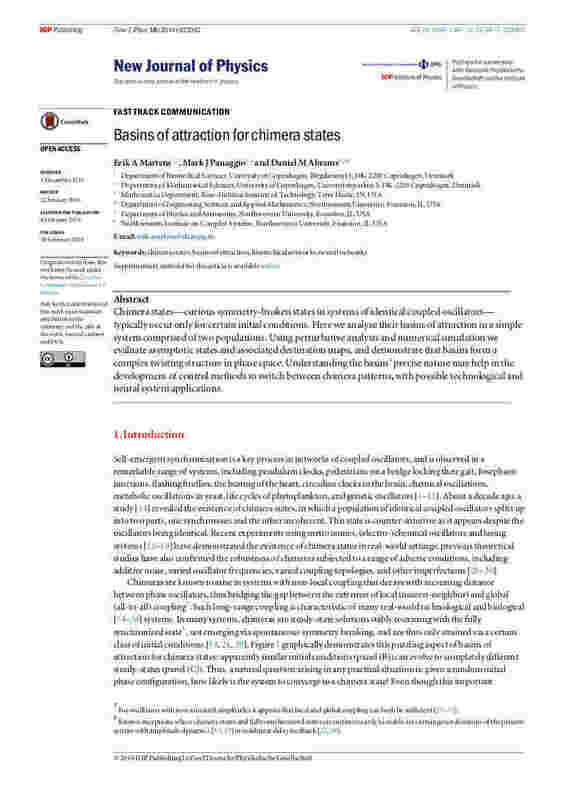 Abrams, "Basins of attraction for chimera states," New Journal of Physics 18 (2), 022002: Feb 18 2016. Supplementary videos (mp4 format): video 1, video 2, video 3, video 4. Description of supplementary videos is here. M.J. Panaggio, D.M. Abrams, P. Ashwin, and C.R. Laing. 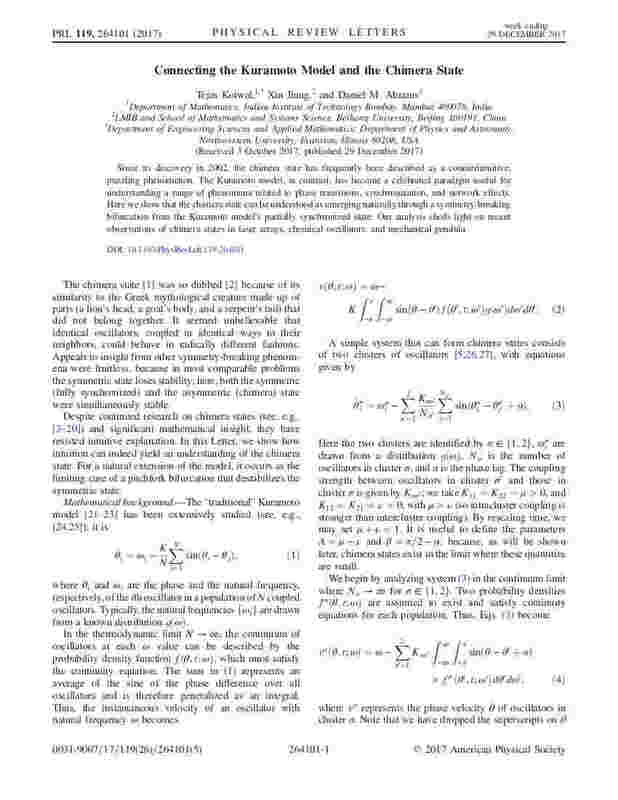 "Chimera states in networks of phase oscillators: The case of two small populations," Physical Review E 93 (1), 012218: Jan 28 2016. J.C. Lang, D.M. Abrams, and H. De Sterck. 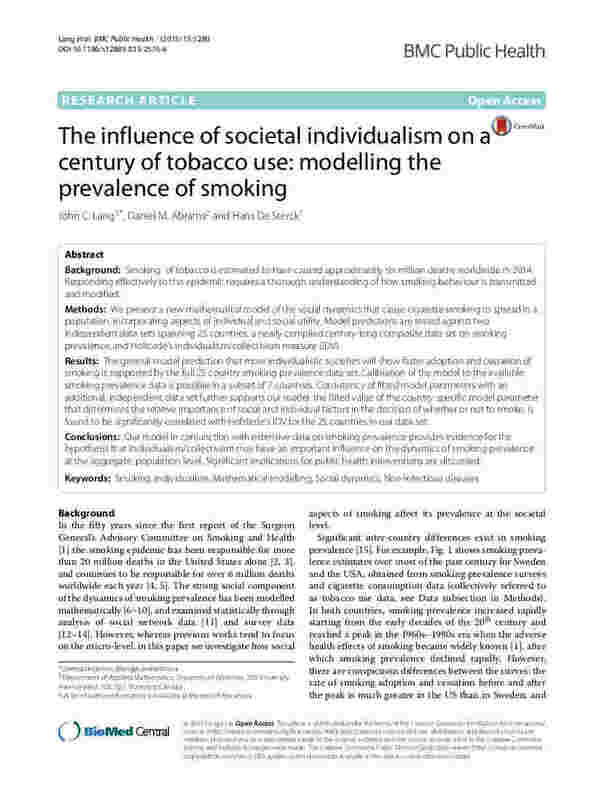 "The influence of societal individualism on a century of tobacco use: modelling the prevalence of smoking," BMC Public Health 15 (1280), 1-13: Dec 22 2015. M.J. Panaggio and D.M. Abrams. 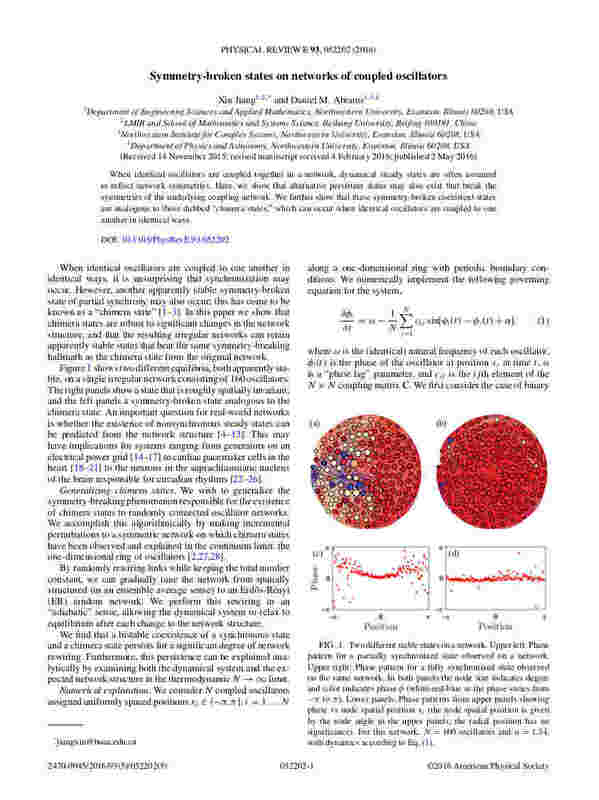 "Chimera states on the surface of a sphere," Physical Review E 91 (2), 022909: Feb 11 2015. (Review paper) M.J. Panaggio and D.M. Abrams. 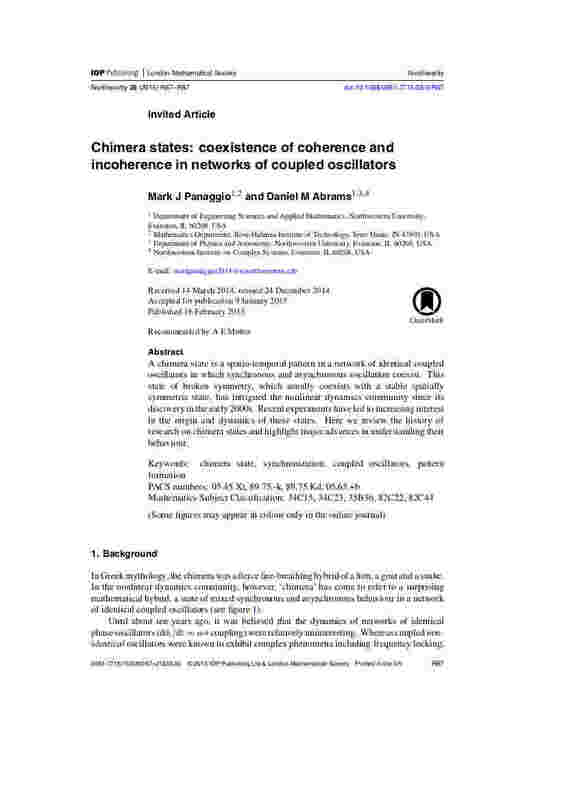 "Chimera states: Coexistence of coherence and incoherence in networks of coupled oscillators," Nonlinearity 28 R67-R87: Feb 16 2015. S.H. Lee, R. Ffrancon, D.M. Abrams, B.J. Kim and M.A. Porter. "Matchmaker, matchmaker, make me a match: Migration of populations via marriages in the past," Physical Review X 4 (4), 041009: Oct 16 2014. Supplemental material: here (text-format data file). D.M. Abrams, A. Slawik, and K. Srinivasan. 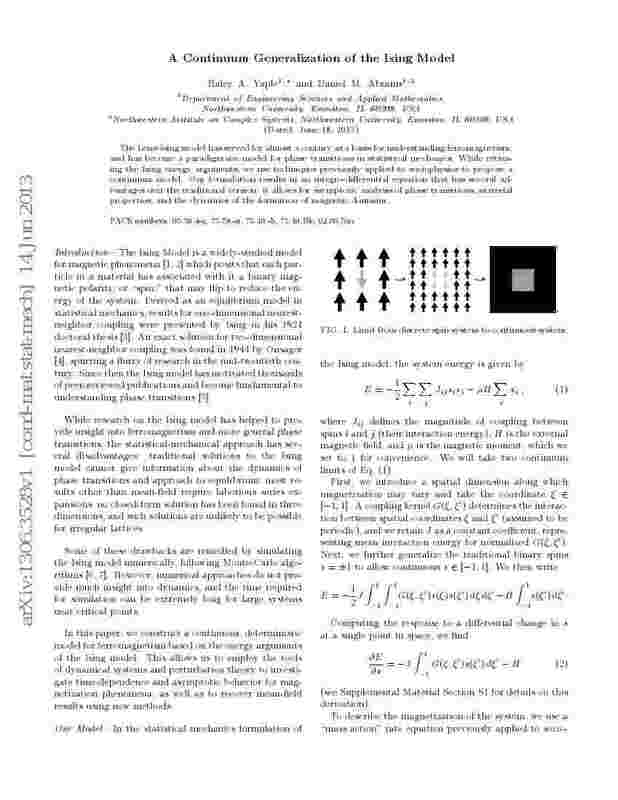 "Nonlinear oscillations and bifurcations in silicon photonic microresonators," Physical Review Letters 112 (12), 123901: Mar 24 2014. M.J. Panaggio, B. Ottino-Loffler, P. Hu, and D.M. Abrams. 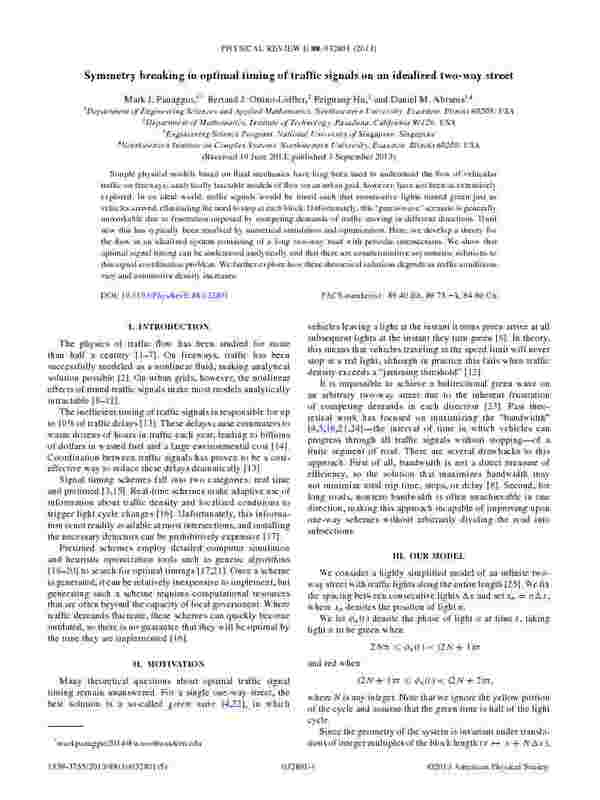 "Symmetry breaking in optimal timing of traffic signals on an idealized two-way street," Physical Review E 88 (3), 032801: Sep 3 2013. Supplemental material: here. Supplementary videos: here (4.18 MB), here (4.90 MB), and here (4.78 MB). H.A. Yaple and D.M. Abrams. "A continuous generalization of the Ising model," currently in revision. My copy: click here or on image. 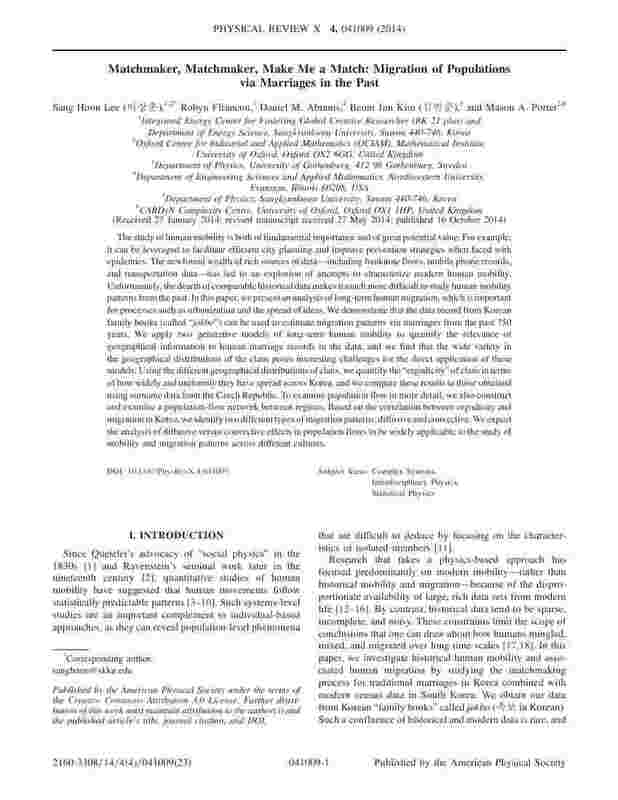 arXiv copy: here. F.A. McRobie, G. Morgenthal, D.M. Abrams, and J. Prendergast. "Parallels between the wind excitation and the crowd loading of bridges," Philosophical Transactions of the Royal Society A 371 (1993), 20120430: May 20 2013. M.J. Panaggio and D.M. Abrams. 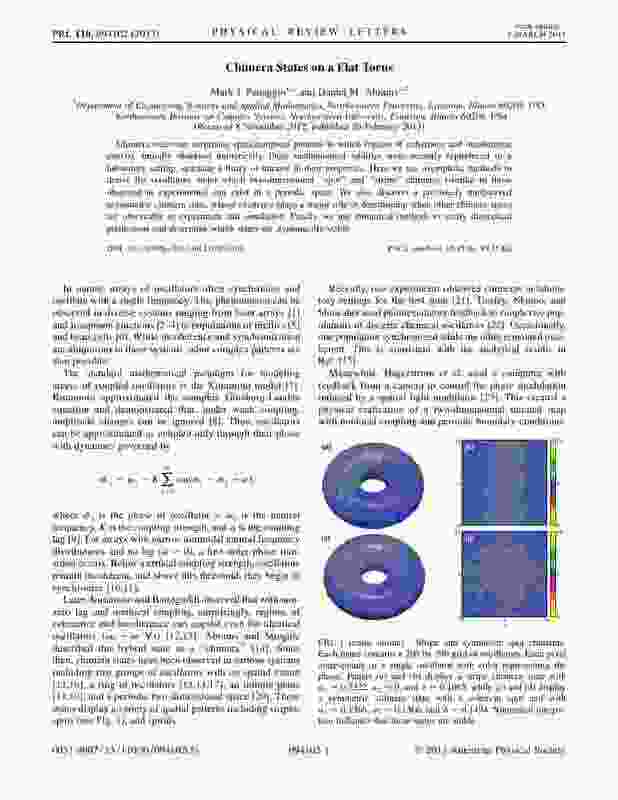 "Chimera states on a flat torus," Physical Review Letters 110 (9), 094102: Mar 1 2013. D.M. Abrams and M.J. Panaggio. 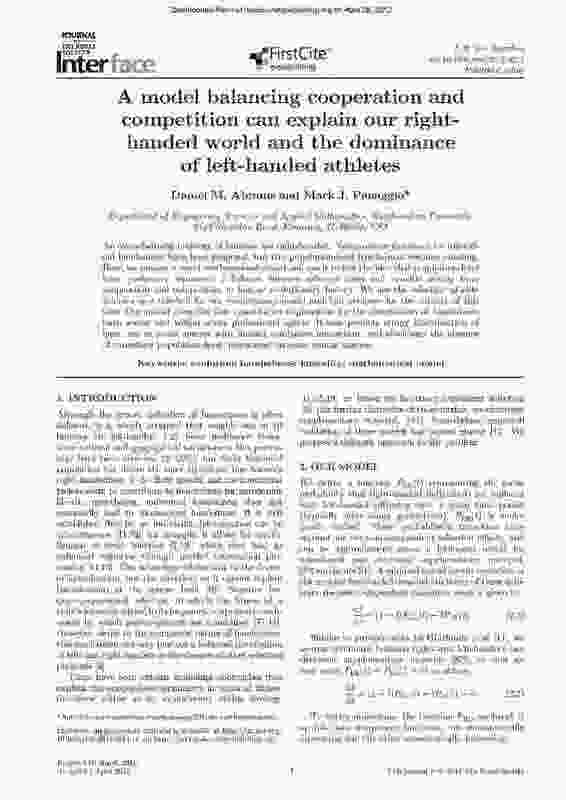 "A model balancing cooperation and competition can explain our righthanded world and the dominance of left-handed athletes," Journal of the Royal Society Interface 9 (75), 2718–2722: Apr 25 2012. D.M. Abrams, H.A. Yaple, and R.J. Wiener. 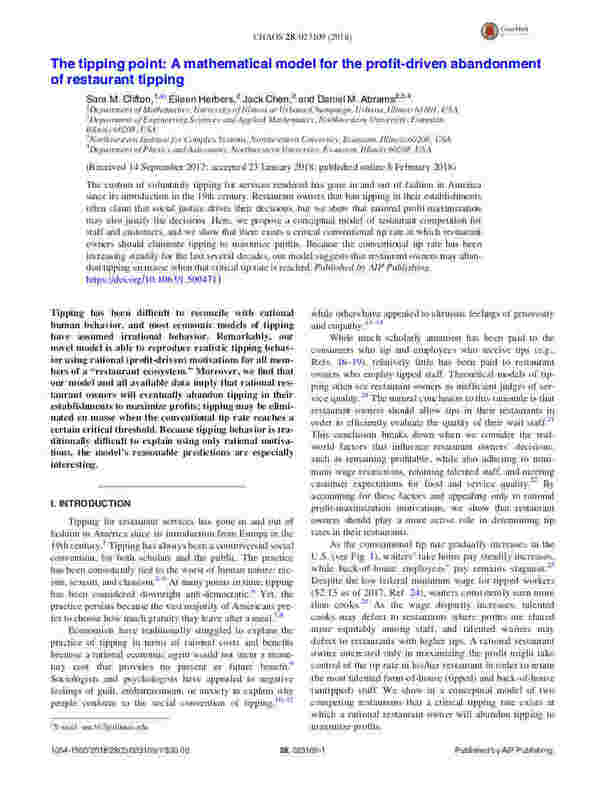 "Dynamics of social group competition: modeling the decline of religious affiliation," Physical Review Letters 107 (8), 088701: Aug 19 2011. A.P. 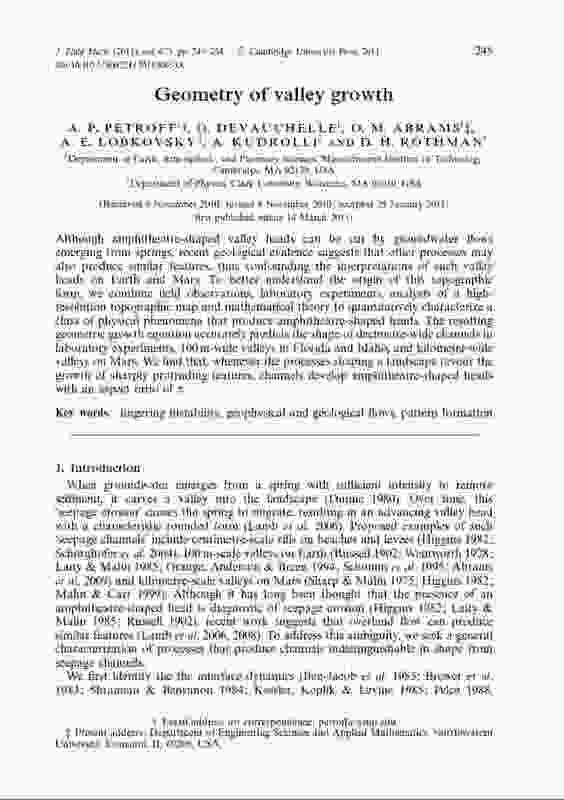 Petroff, O. Devauchelle, D.M. Abrams, A.E. Lobkovsky, A. Kudrolli and D. H. Rothman. 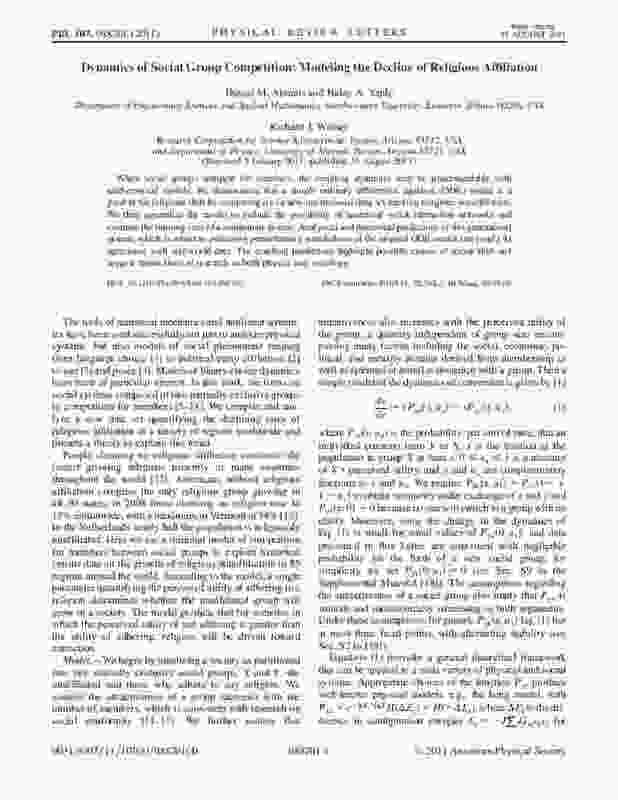 "Geometry of valley growth," Journal of Fluid Mechanics 673, 245–254: Apr 24 2011. D.M. Abrams and R.J. Wiener. "A model of peak production in oilfields," American Journal of Physics 78 (1), 24–27: Jan 2010. D.M. Abrams, A.E. Lobkovsky, A.P. Petroff, K.M. Straub, B. McElroy, D.C. Mohrig, A. Kudrolli, and D.H. Rothman. 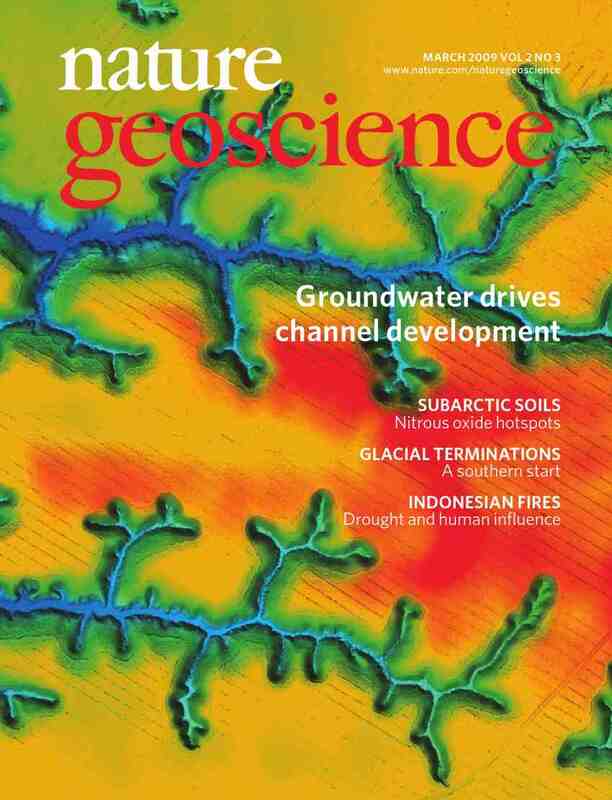 "Growth laws for channel networks incised by groundwater flow," Nature Geoscience 2 (3), 193–196: Mar 2009. Supplementary information: here. Supplementary videos: here (8.91 MB) and here (5.91 MB). Also available: cover, backstory (hatchet incident happened to me! ), and news & views. D.M. 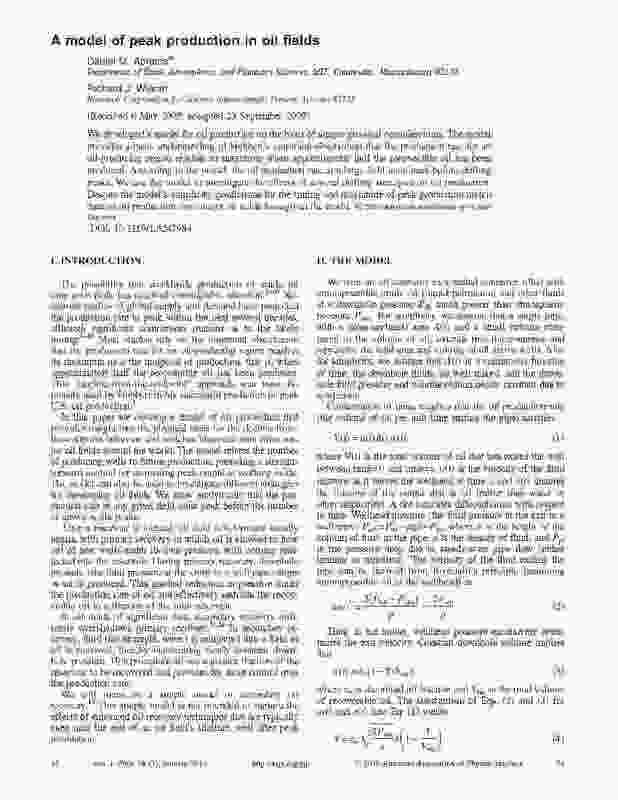 Abrams, R. Mirollo, S.H. Strogatz, and D.A. Wiley. 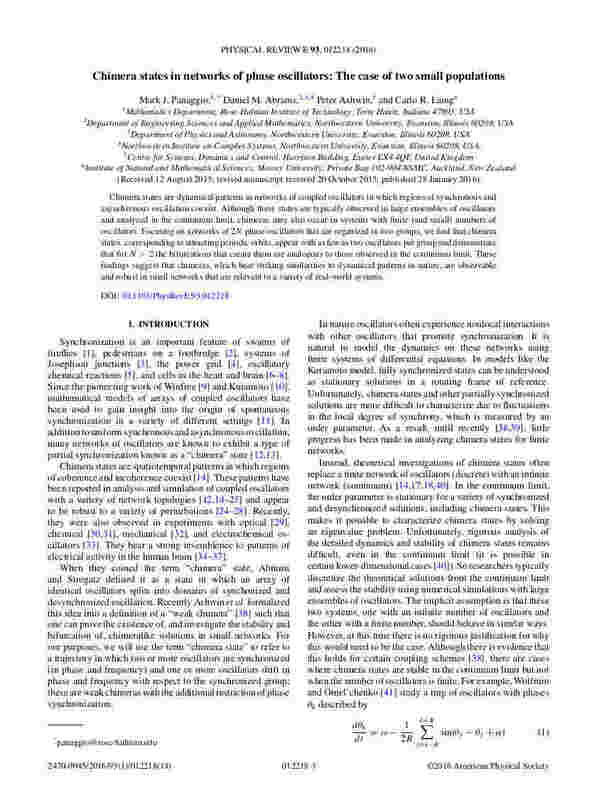 "Solvable Model for Chimera States of Coupled Oscillators," Physical Review Letters 101 (8), 084103: Aug 22 2008. B. Eckhardt, E. Ott, S.H. 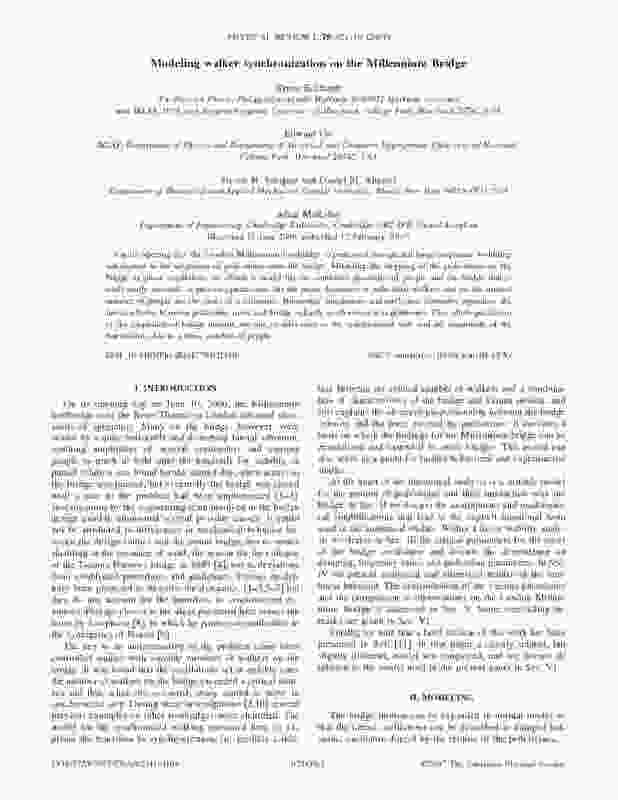 Strogatz, D.M. Abrams, and F.A. McRobie. 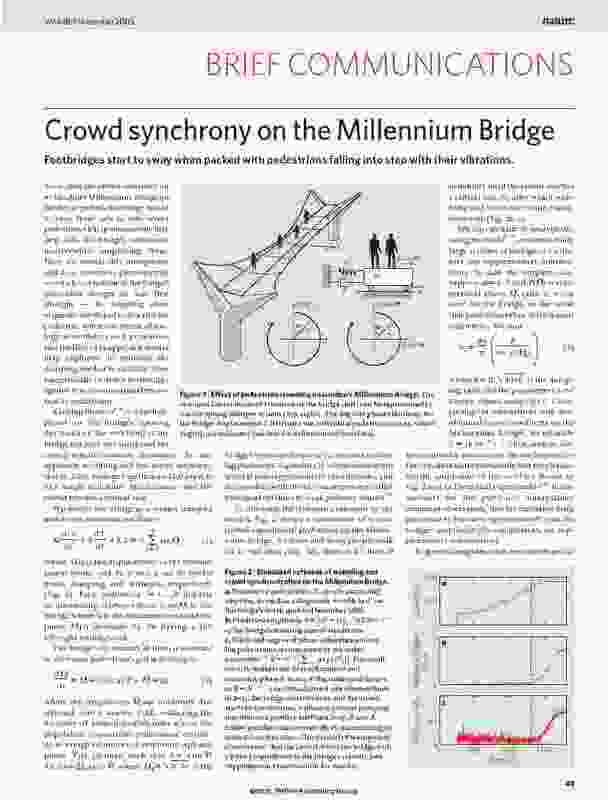 "Modeling walker synchronization on the Millennium Bridge," Physical Review E 75 (2), 021110: Feb 12 2007. R.J. Wiener and D.M. Abrams. 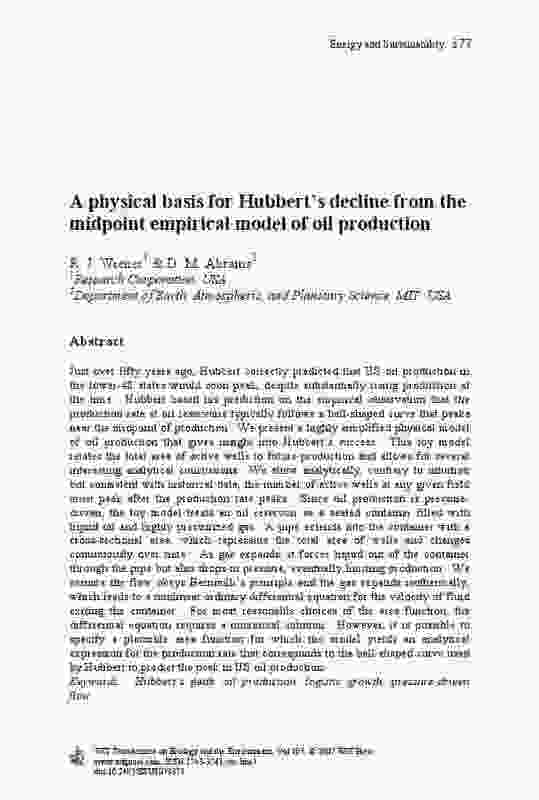 "A physical basis for Hubbert's decline from the midpoint empirical model of oil production," WIT Transactions on Ecology and the Environment 105, 377–383: 2007. Abrams, Daniel Michael. 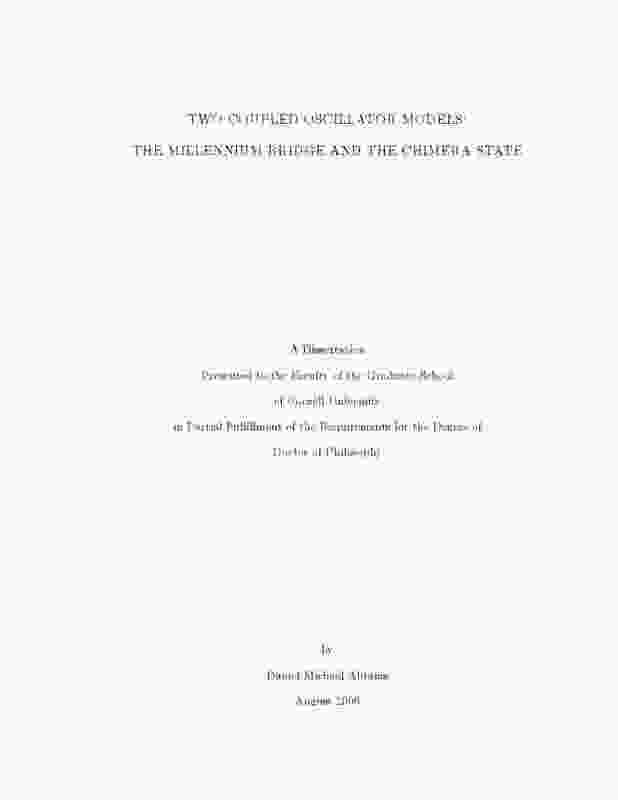 "Two coupled oscillator models: the Millennium Bridge and the chimera state," Cornell University Ph.D. Dissertation, Aug 2006. D.M. Abrams and S.H. Strogatz. 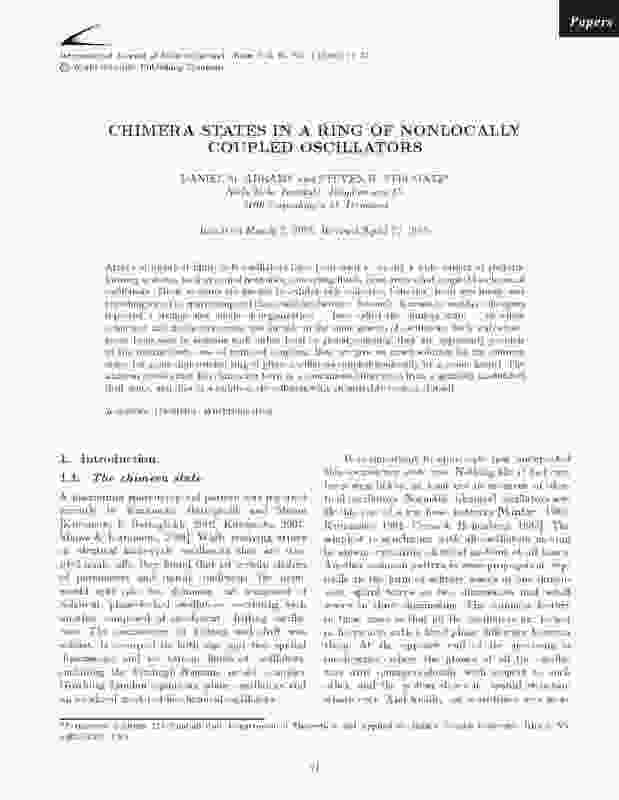 "Chimera states in a ring of nonlocally coupled oscillators," International Journal of Bifurcation and Chaos 16 (1), 21–37: Jan 2006. S.H. Strogatz, D.M. Abrams, F.A. McRobie, B. Eckhardt, and E. Ott. "Crowd synchrony on the Millennium Bridge," Nature 438 (7064), 43: Nov 3 2005. D.M. Abrams and S.H. Strogatz. 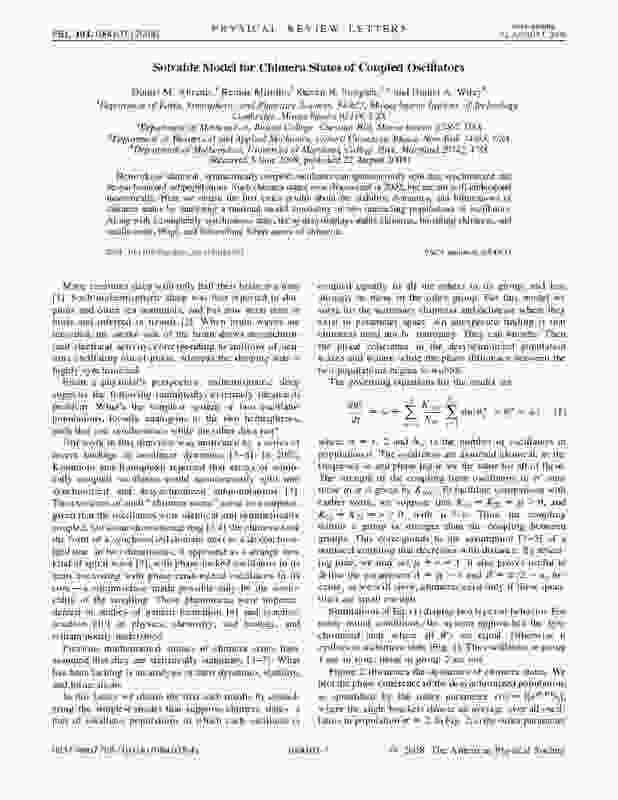 "Chimera States for Coupled Oscillators," Physical Review Letters 93 (17), 174102: Oct 22 2004. D.M. Abrams and S.H. Strogatz. 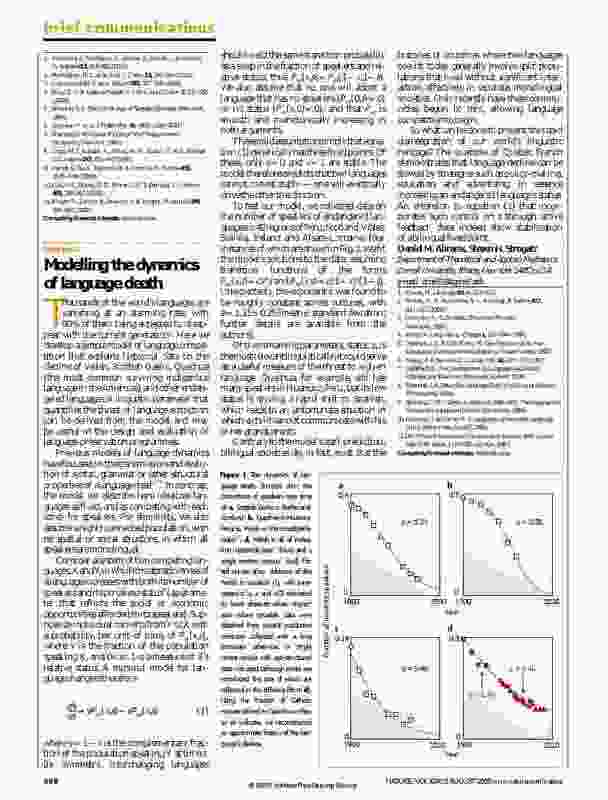 "Modelling the dynamics of language death," Nature 424 (6951), 900: Aug 21 2003.